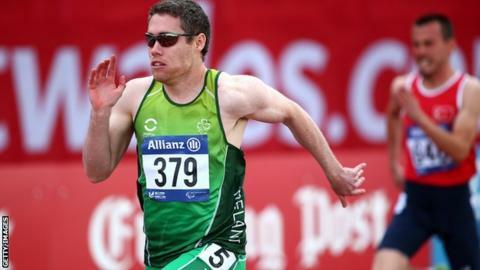 Jason Smyth regrouped from the upheaval of his category reclassification to win his first event at the IPC European Athletics Championships in Swansea. Visually-impaired Smyth has dominated T13 sprinting at world level since 2006 but was moved into the T12 category on the eve of the Swansea championships. However, Northern Irishman Smyth took a dominant victory in the 100m on Tuesday as clocked 10.78 seconds in the final. The Irish team member, 27, will chase 200m gold on Thursday. Smyth, a double gold medallist at both the Beijing and London Paralympics, jogged for most of the way in his morning heat as he won in 11.40 before picking up his pace in the afternoon final. The Northern Ireland Commonwealth Games representative was only third fastest qualifier for the final but he finished way ahead of the opposition as Russian runner-up Artem Loginov clocked 11.16. The Londonderry athlete was delighted to pick up another major title but acknowledged that his reclassification, because of the progression of his Stargardts condition, had been unsettling. "Championship running is about getting medals. Times will come some days others they won't," said Smyth, who set his personal best best of 10.22 in 2011. "I was last tested nine years ago at an IPC event but when things deteriorate you don't notice unless it is a massive change. I hadn't noticed anything. "I found it hard getting my head right for the races with the ifs and buts. "Three days ago I was due to race on Wednesday and Thursday. Now I am racing Tuesday and Thursday so there is a lot to get your head around." Smyth added that he had delayed undergoing his IPC tests ahead of the Swansea championships because of his Commonwealth Games commitments. "I didn't want to deal with the testing at that point. "But ironically, I have come here and it has been tough to deal with so the one lesson I have learned for the future is when I have to be tested again I wouldn't do it before a major championship." As a T13 athlete Smyth was facing the prospect of only being in a position to defend one of his titles at the next Paralympic Games in Rio as the T13 200m event had been removed from the list of Rio medal events published last year. However, a T12 athlete Smyth will be in a position to contest both 100m and 200m events in Rio. Smyth's fellow gold medallist from the Beijing and London Paralympics Michael McKillop will be favourite to win gold in Wednesday's T38 800m which will be run as a straight final at 12:22 BST.